At $70/node (assuming they don’t get volume pricing and assuming $35 for the Pi and $35 for the PiTFT shield)… I hate to be critical but you could build out a /lot/ more power for $8400 than 120 Raspberry Pis. Don’t forget ancillary items like wiring, hubs, cords, etc. Would virtual servers even be faster? Their purpose is to test pushing updates anyway, not overall raw horsepower. Reminds me a bit of those people who used to play something like 30 role playing game characters at once. Exactly – this is a piece of test equipment for resin.io’s infrastructure. The fact that it can also be used to do some fun stuff like trying out 120 node multiprocessor setups is just icing on the cake. The Pi’s are for testing the service they provide, which is deploying node apps to embedded systems like the Pi; the Pi’s you see here are not the server infrastructure, and virtualization wouldn’t really do. If virtualization wouldn’t really do, then you’re doing it wrong. They probably got pretty good volume pricing- the PiTft went up on sale on massdrop for about 20$- possibly a bit less, I can’t see the price at the moment. As for the RaspPi, I couldn’t find any evidence of non-distributor bulk pricing- and Alibaba/Aliexpress sell for about 2-3$ less, so read into that what you will. I suppose the price of the rasppi is actually pretty close to hardware costs, they do label themselves a charity. Oh, and besides, a 120 rasspi cluster has a huge amount of geek cred. You could do some pretty neat stuff with that many screens. Also, he may be able to rent it out, there’s a lot of people who might have a use for something like this. Oh, a price that wasn’t factored in was the switches, I’m too lazy to look but they look to be pretty decent. The PiTFT dropped to it’s final price of $26.49. I know cause I was in on that drop. What kind of computer AND advertising can you get for $8400? They need to make it functional as a couch before they get the classic cray cred. That’s how you make a really big cluster. You might actually be able to ask them about it, who knows, they might sell one. http://www.element14.com/community/community/raspberry-pi/raspberry-pi-compute-module?ICID=rpimain-topban-compmod would save tuns of space. Hell even the odroid-w before the project got nuked for unnamed reasons. But unless someone else than hardkernel is making the odroid-w, the devices will soon be sold out. Which is a shame, I was going to buy some for a prototype. 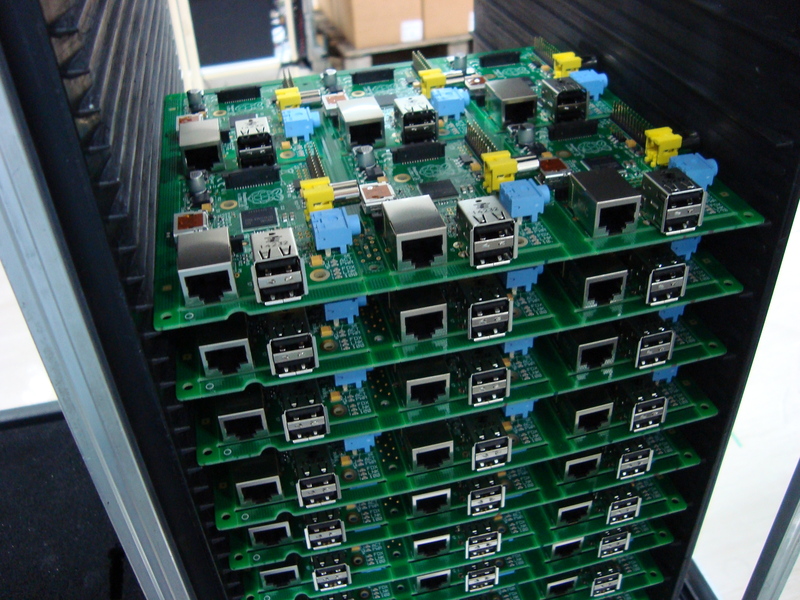 I’m always fascinated by these one-off, one of a kind clustered systems like this Raspberry Pi rig. Kudos for doing the assembly and getting it all running. As the comments mention it may not be practical in terms of price. But still it’s pretty cool for what it is. The ideia is also impressive: updating firmware in a “hot” way. Bad thing is that the whole system may be programmed for that, and connected to the internet all the time. its not even practical as a test jig – why would you need 120 small lcds instead of piping video buffers to one central location? If they have one color being displayed pre-update and one post update this would be an effective system with very fast visual identification of any issues. $30 times 120 to replace a led? yes that makes sense …. Out powered by my 24 core AMD workstation. And it uses less power and was cheaper too. Pretty stupid, since everyone else is reducing the machine count by virtualisation. It’s not about how many cores it has – it’s about testing firmware updates on real targets. Which makes an even better case for virtualization. They bought adafruit displays because they like paying more? What would I do with a 120 node RasPi cluster? Post it on a bunch of sites for free advertising, then part the boards out on eBay. Just stopping by to view the comments on “Virtualization is cheaper” & you get more power from x & y. It looks like a nice project to me. Sometimes its not about power or need. Its about building what you want? I am sure most guys here have no idea what that means. Or how about the old cliche about “its not the destination, its the jurney”….. If there isn’t a corollary to Ockham’s Razor, there needs to be. There are always many, many ways of solving a problem (which is what you meant to type instead of “building what you want”). The one that does so with maximal efficiency and efficacy is the one that wins. Sorry. Maximal efficiency and efficacy is very productive but I spend way to much time maximizing my productive. Sometimes I want to be inefficient and unproductive to see if I can accomplish something in a certain way or just for the joy of it. So sometimes I take the inefficient way home (otherwise known as the long way home). I drive with the top down whenever possible and drive with quick take-offs and down-shifting prior to stops despite what the increased drag and rpms do to my gas mileage. I built my own quad-copter with an APM board which ended up costing me more than a similar pre-built kit would have cost me before you even consider all the time I put into it since I had no clue what I was doing (but I learned). I even rebuilt an old-school ski machine video game which ended up costing a couple hundred bucks and about 80 hours – most of which was just searching for parts – when I could have just gutted it, put a flatscreen on and connected it to a tiny computer to make an arcade cabinet that played hundreds of old-school games. But the analog nature of this thing was so amazing that I just wanted to see it in action. For anyone curious…The game has a rotating lampshade looking thing inside laying horizontally with a lightbulb inside and ski flags cut out and a copper pad on each side of the flags. There’s a springy copper do-dad attached to the foot-pads you would swing side to side and it also connected to your ski man. So as you were skiing, the flags would roll down the screen and you would swing side to side to get your man between the poles. If you missed, this device I have no name for that’s a cross between a solenoid and a coil gun would be triggered by the electrical contact and fire its projectile. The thing was located at the top and was mounted about an inch from the top with a 2 inch projectile and would fire into a metal plate mounted there and make a very loud “pop” sound like someone hitting the cabinet with a hammer. Since the “projectile” was 2 inches long and fit entirely inside the shaft, once it fired it would simply fall back into the shaft and the capacitor would energize again until it was triggered again. The electrical contact also advanced a mechanical counter one click and after 10-clicks the game stopped until you put more money in. It was amazing! How about using this for parallel computing like Berkeley Open Infrastructure for Network Computing (BOINC) to do cancer research or solar energy research. You could also use it for a 3D render farm. BOINC and 3D rendering both need lots of CPU power. wow you guys totally missed the end goal . it is about pushing updates to the client , 100+ units at once . so lets see if the patch/firmware/update works . This is QA testing . we have a room with over 500 terminals linked like this for doing the same thing when ever we do a new OTA resale . It’s not exactly easy to virtualize the rPi. Sure it can be done, but I like not angering the hypervisor in my lab. For firmware testing, this is actually a pretty solid approach. Dunno about 120 screens when they could use another solution to get display data. VMs solve a lot of problems, but occasionally stuff really should be tested on baremetal matching what it will see in production. Very cool.. we’ve explored the same option at PicoCluster.